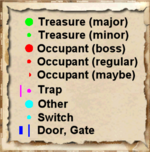 The walkthrough section could use a closer look—some bits are poorly worded and/or difficult to follow. As soon as you enter Fort Irony, you will see a corner relatively close. This is a U-turn and after this corner there will be a straight corridor leading to stairs descending to a lower hall. Straight ahead in this hall will be a leveled enemy (probably a Goblin). If you take a right into the hall (instead of going straight ahead), there will be another enemy. There is also a sack in a barrel near the enemy to the right. Going straight ahead to where the leveled enemy is you will find a locked chest containing gold and a sack next to a pile of bones and a small fire. At this point the corridor takes a right turn. Going straight will lead you to a chest containing gold. Before you reach this chest there will be a swinging mace trap that is activated by a pressure plate. Turning right before this chest will lead you through yet another corridor. At this point you can turn left or right. Turning left will lead you to an encounter with a leveled enemy and you will enter a new room. In this room there is a roasted rat, which when opened will contain three rat meat, a chest, which contains random leveled loot, and a wooden chest which contains the ultra rare Shadowbanish Wine. To continue through the ruin you must enter through a cave like corridor. The corridor leads to a half-cave, half-fort like room. This room contains two leveled enemies. To continue through the ruin you must proceed through to another fort-like corridor until you reach a square-like hallway. This hallway contains an enemy and a swinging mace trap that is activated by a pressure plate. 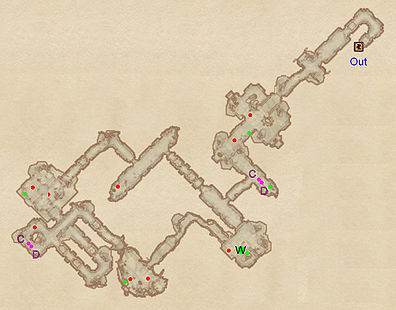 If you are slow to adventure through this ruin, it is most likely that the enemy will die by walking into the trap. 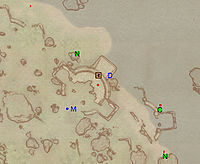 To proceed further through the ruin you must walk through the corridor going down to the left which leads to another U-turn corner with a leveled enemy straight ahead. It is recommended you sneak here because this leveled enemy will spot you and in the room behind it there is another leveled enemy. Straight ahead to the left is a chest containing a leveled potion/poison. In this room there is another roasted rat above a fire. To proceed further you have to go through the corridor on the right which leads you to a hallway in which you can go left or right. Going right will lead you to a leveled enemy and yet another roasted rat above a fire. Turning left will lead you to the way out which is through yet another corridor. At the end of this corridor is where you had the option to turn right before. Going straight ahead at this point will take you back in a circle. 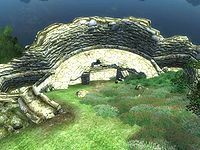 At this point the only way to exit the ruin is to take your first left in which you will travel back to the entrance/exit. Esta página foi modificada pela última vez à(s) 07h59min de 14 de outubro de 2013.